If you’ve read my other reviews for Hills foods you’ll know I’m not a huge fan of the company. Thankfully they’ve cleaned it up a fair bit for their Ideal Balance range. This review is for the Chicken and Potato Grain Free recipe, but there’s a few grain-based recipes as well. From looking at the guaranteed analysis we find the food is high in protein (33%) which is great to see, and also high in fat (23.2%) which is good for providing energy. 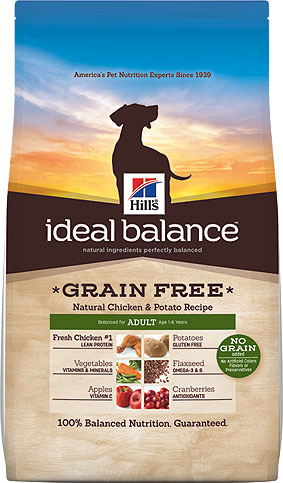 That really raises the bar as far as Hill’s products go, although the fat content is worth keeping in mind if your dog is overweight or gaining weight. The first listed ingredient is Chicken, which we might initially assume is the main source of protein in the food. From looking into the ingredients a bit further we find Yellow Peas and Pea Protein Concentrate are fairly prominent, both will inflate the protein levels giving us that 33%. Personally I believe a canine diet should offer more in the way of meat proteins than vegetable proteins, and once the chicken is cooked it becomes far less significant (chicken is approx. 70% water). The main source of carbs is potato. 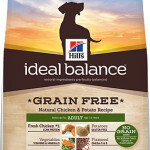 In most grain free foods we find either potato or sweet potato, with the latter being the better of the two. Potato is high GI, so not something you should be feeding day in day out in high quantities, which looks to be the case with this food. It has to be said you’re far better off feeding a potato-based food than one of the many cheap wheat and/or sorghum based foods we find in the supermarkets. Chicken Fat is included as the 5th ingredient as an essential source of energy, and Chicken Meal further down the list adds an additional meat ingredient. We find no nasty signs of cheap meat in this food, such as tallow and animal digests, so that suggests the meat is a decent quality. We find a range of decent and well thought out ingredients in this food (something I never imagined saying about a Hill’s product). It’s great to see flaxseed, fruits, veggies, and a decent range of vitamins and minerals. This is what I’d expect from a company that sells relatively expensive foods worldwide. Overall this is a decent food, and it’s great to see the Hill’s company moving in the right direction after all these years. It’s a definite improvement over the regular Ideal Balance. Feeding this food combined with another food without the potato quantity could be a decent solution to a well-rounded diet. Considered ingredients of a far better standard than other Hill’s products. Protein levels will be largely bulked up from pea protein. Potatoes are in sufficient quantity and are a high GI ingredient. Chicken, Potatoes, Yellow Peas, Pea Protein Concentrate, Chicken Fat, Potato Starch, Dried Egg Product, Chicken Meal, Dried Beet Pulp, Flaxseed, Lactic Acid, Chicken Liver Flavor, Vegetable & fruit blend (Green Peas, Apples, Cranberries, Carrots, Broccoli), Calcium Sulfate, Choline Chloride, Iodized Salt, Fish Oil, DL-Methionine, L-Lysine, Potassium Chloride, Taurine, vitamins (Vitamin E Supplement, L-Ascorbyl-2-Polyphosphate (source of vitamin C), Niacin Supplement, Thiamine Mononitrate, Vitamin A Supplement, Calcium Pantothenate, Riboflavin Supplement, Biotin, Vitamin B12 Supplement, Pyridoxine Hydrochloride, Folic Acid, Vitamin D3 Supplement), minerals (Ferrous Sulfate, Zinc Oxide, Copper Sulfate, Manganous Oxide, Calcium Iodate, Sodium Selenite), Mixed Tocopherols for freshness, Phosphoric Acid, Beta-Carotene, Natural Flavors.